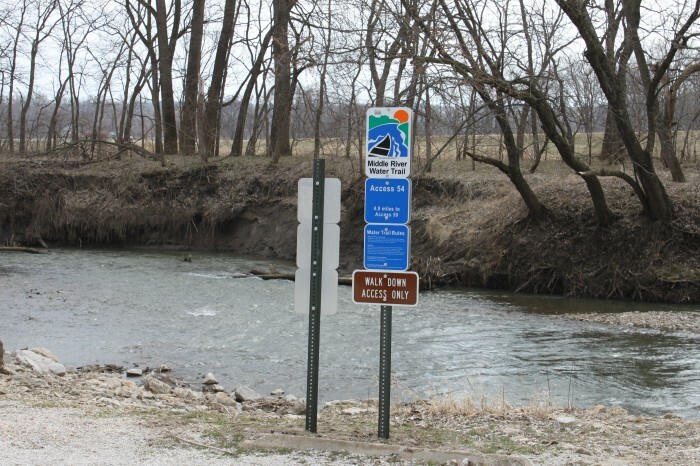 Middle River Park, located on the south edge of Winterset, is managed as a recreational area that provides users with picnic and shelter facilities, river access to Middle River and a hard-surfaced trail system. 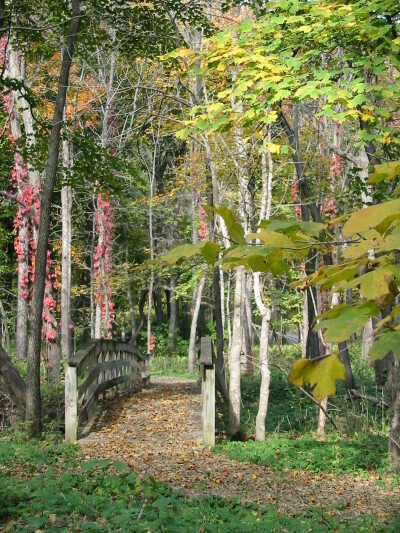 Middle River Park is 80 acres of primarily woodlands made up of giant Cottonwood, Hackberry, Silver Maple and Walnut trees that grace the lower picnic grounds and two-level shelter facility, gradually giving way in the upper elevations to beautiful stands of native Black Maples and eventually Oak/Hickory forests. 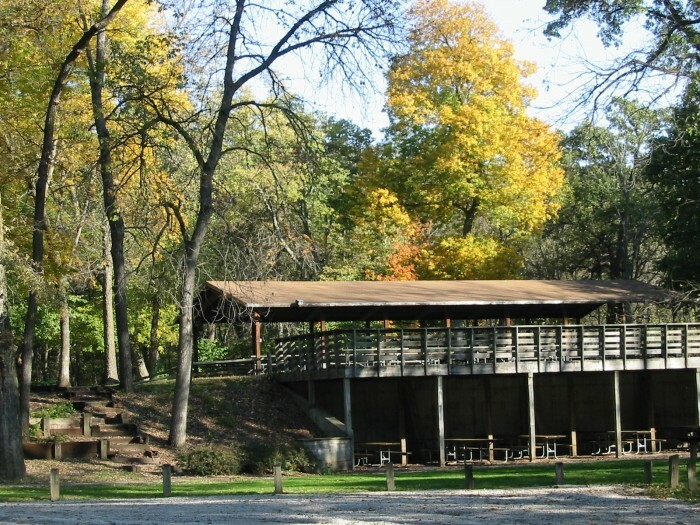 Middle River Park adjoins the larger Winterset City Park, with the parks connected by a trail converted from an abandoned road. 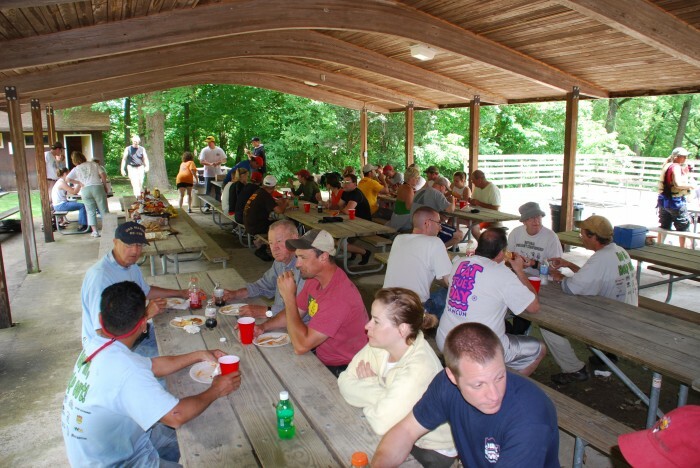 Picnicking & Shelter: A two-level picnic shelter provides picnic facilities for large groups. Upper level (200 person capacity) is available for reservations. The lower level (100 person capacity) is kept open on a first come/first serve basis. The shelter is surrounded by landscape beds of colorful perennial and annual plantings. Handicapped accessible. Other picnic facilities (tables & grills) are located on the lower grounds between the shelter and Middle River. Hiking & Cross Country Skiing: Park visitors use both the hard surfaced trail system as well as the park road system to hike through the park and the adjoining Winterset City Park to the north. 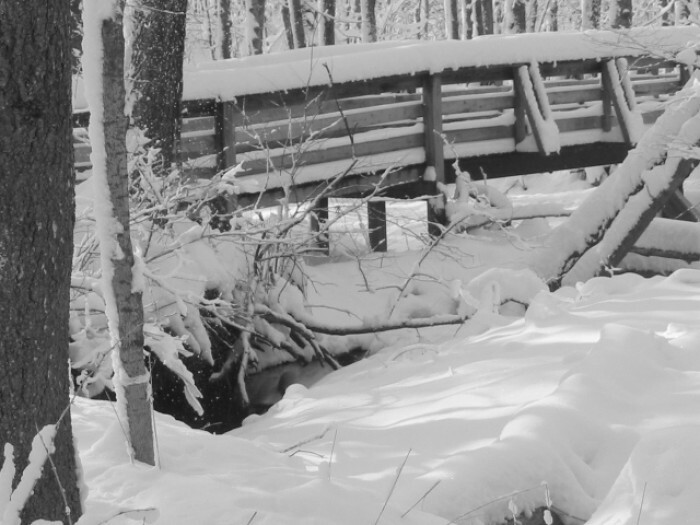 During winter season, the road system is closed and utilized as cross-country ski trail system connecting to the road system in the adjacent Winterset City Park to provide for over 3 miles of wind-protected ski trails. Play Equipment: Youth play equipment is located in the lower picnic grounds. Canoeing & Rafting: A developed canoe access to Middle River is located on the south end of the park. 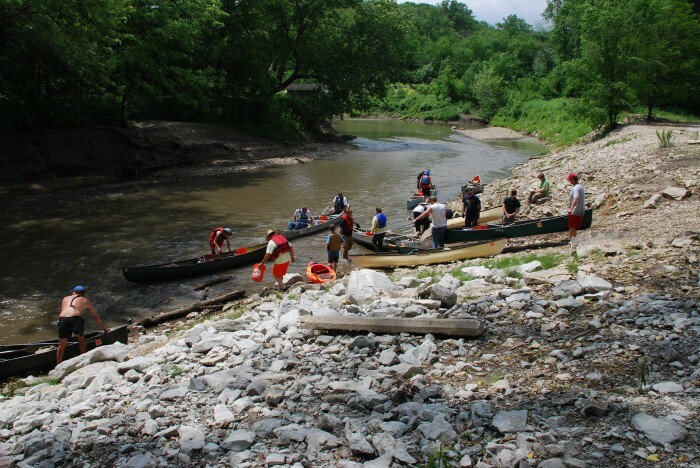 See River Access section for more information on canoe trips along Middle River. 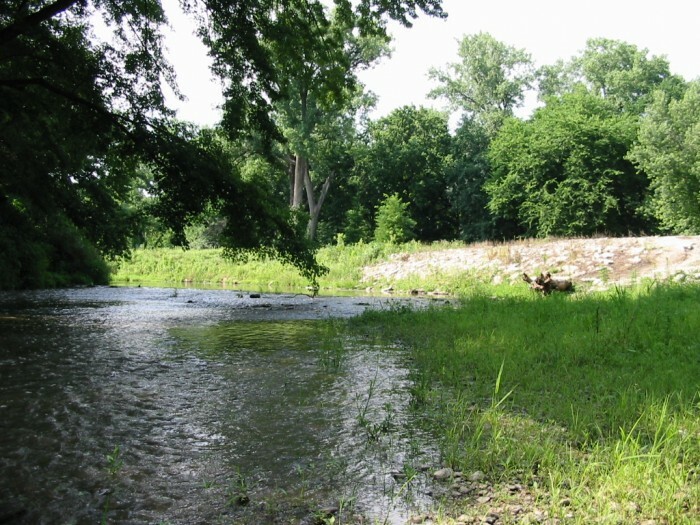 River Fishing: Good location to fish for Channel Catfish. Nature Study & Photography: Middle River Park is one of the Conservation Board’s best areas to view neo-tropical bird migrants during the spring and summer months. Maple Syruping: Beginning in mid to late February, Conservation Board staff tap Black Maple trees and collect sap for syrup production. Call the Conservation Board office (515-462-3536) to arrange tours of the project and to find out what days they will be cooking the sap into syrup. Click for information about shelter reservations and policies. 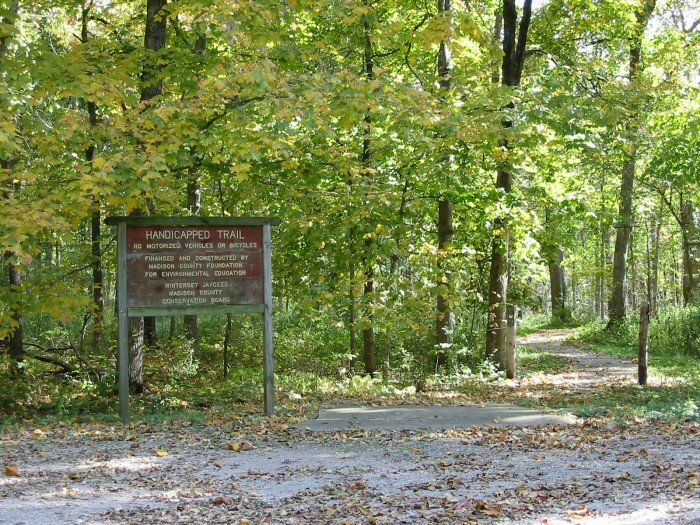 Middle River County Park is located 1 mile south of Winterset on County Road P-71 with the entrance of the park directly across the highway from the Board’s Operations Center.